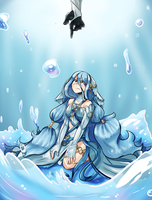 Comission work featuring Azura from Fire Emblem and the Deportivo Alavés. Gee, I wonder who paid you for that. I think it's a mystery. A man pretending to be a nihilego, writer in Vrutal Today. A person shrouded in mystery, yes.